NYC riders Laura Solis and Ayesha McGowan. Photo by Liz Clayman. The goal of the League of American Bicyclists is to make bicycling safe and comfortable for people of all ages in all communities, but we recognize that youth, women and people of color are underrepresented in many bike advocacy efforts and local transportation decisions. 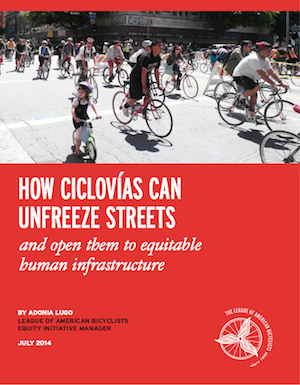 Equity issues have been a source of discussion in the bicycle movement for many years. However, there has been a lack of dedicated staff capacity, direct knowledge, and guidance from local leaders of color in engaging in a sustained, strategic dialogue about these issues. Currently there are few resources to address disparities on the ground and equity as it relates specifically to bicycle advocacy. The League's initiative works to innovate solutions to this problem by working directly with diverse leaders to change the culture and programming of the League itself, which will contribute to transforming cycling advocacy at the local and national level. Through its Equity Initiative, the League engages leaders from traditionally underrepresented demographics and bridges the current gap between diverse communities and bicycle advocates. 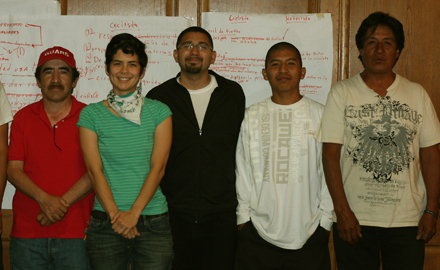 By adding staff capacity, undertaking an internal equity assessment and transformation process, and partnering with equity advocates in strategic and sustained relationships, the League will leverage its position as the longest-standing and most-trusted source of bicycle advocacy resources to develop diverse leadership and cultivate effective local partnerships to advance inclusion and, ultimately, equity in the bike movement. The League has already committed resources to this effort. 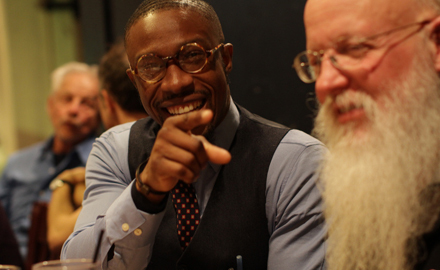 In 2013, the League hired an Equity and Outreach Fellow, Hamzat Sani, who has experience organizing in underserved communities and bridging the gap between advocates of color and traditional bicycle organizations, to guide this effort in its first six months. The League established an Equity Advisory Council and brought together the members of the Council to meet in person at the 2013 and 2014 National Bike Summits. We continue to move forward with specific goal-setting via ongoing email discussion and monthly conference calls. In November 2013, Dr. Adonia Lugo became the League's first Equity Initiative Manager thanks to generous support from the Robert Wood Johnson Foundation. The League Board of Directors has adopted equity as one of our top priorities, and our commitment to equity, diversity, and inclusion resonates through our mission and vision. In July 1895, a young bi-racial woman entered the gathering of the League of American Wheelmen (LAW) in Asbury Park, New Jersey, seeking to gain entry as a card carrying member. As simple as this routine had been for the few years she had been a member of the LAW this time was extraordinarily different — this time Katherine “Kittie” Knox expected to be barred because of her skin color. It had only been a year since Colonel William W. Watts of Louisville, Kentucky, had finally completed his successful campaign of establishing a resolution in the National LAW Constitution that relegated membership to “none but white persons.” The resolution, passed at the League’s National Assembly February 20, 1894, by a 127 to 54 secret vote, took three attempts to finally pass (starting with an effort in 1892) even with unanimous support from the League’s southern membership. Watts campaign to establish a color bar in the League was one of persistence, dedication and cunning. When Watts initially introduced the idea in 1892 the northern faction of the League was able to defeat the measure, but by 1893 the writing was on the wall. Watts idea of color bar came during the post-reconstruction era when anti-black sentiment was at its highest in the South and at its most indifferent in the North. After the 1893 vote on the color bar issue proved to be fruitless, Watts lacked the ⅔ majority needed to pass the measure, the Colonel returned to Louisville to make sure the next would be clearly in his favor. Watts secured a largely ambiguous letter of support from the all-black Union Cycling Club in Louisville. Watts used the letter as proof that black cyclists were in support of a color bar as well, when in reality the leader of Union had only agreed to the letter after pressure from Watts and his cohorts in the city, as well as the anti-black faction making it clear that no southern members of the L.A.W. would be black. Watts had successfully established the “whites only” clause in his club’s constitution already. Along with this “letter of support,” Watts also had home field advantage for the 1894 Annual Assembly, which he utilized expertly by making sure to entertain and gift the visiting Wheelmen with whiskey. The resolution was met with much opposition and controversy in the north resulting in a resolution by the Massachusetts Legislature denouncing the L.A.W. color bar. Many northern clubs sought to ignore it or were indifferent about enforcing the color bar. Some, like the Boston delegation to the League’s 1895 Meet in Asbury Park, were determined to make some waves about the matter. Boston had quite a bit to be upset about at the 1895 gathering. They had lost out to Asbury Park in the voting for the location of the very meet they had to travel to attend. The Boston delegation had wanted badly to host the meet in their hometown going as far as to lobby Louis C. Jacquish, Chief Counsel of the Illinois L.A.W. to cease his motion to have the “white only” clause struck from the constitution at the previous gathering for fear that such a motion would cause southern members to vote for Asbury Park as the next host city. Jacquish abandoned his motion and Boston still lost to Asbury Park. On top of that the delegation had posted a failing group vote in opposition to the color bar the previous year. With the Boston delegation came the Riverside Cycling Club, the city’s all black cycling club, a black politician by the name of Robert Teamoh, who was the author of the resolution denouncing the color bar in Massachusetts’ Legislature and of course Kittie Knox, already known in the cycling world for her dashing cycling costumes and affinity for men’s knickerbockers. Needless to say Boston came to Asbury Park with not only a chip on its shoulder but with intentions to oppose recent developments within the national L.A.W. body that were opposed to their relatively anti-racist principles. While there seem to be some discrepancies regarding whether or not Ms. Knox was granted entry most reliable accounts maintain that she was allowed to enter the Wheelmen’s gathering and was in fact one of the highlights of the ball that evening. Knox had been a member of L.A.W. prior to the 1894 bar of non-whites and thus was still a legitimate member and could continue to be a member for as long as she wished. The color bar was arranged, interestingly enough, to bar black from becoming new members but allow for non-whites to race in League sanctioned races. This partial barring allowed the League to certify races with big name stars like Major Taylor and even declare him a national and world champion without the possibility of Taylor’s voice being heard as part of the Wheelmen’s membership. 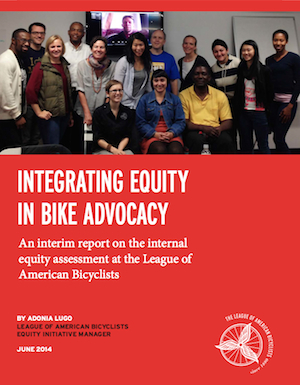 Earlier this year The League formed the ten member Equity Advisory Council in response to a persistent call by advocates around the nation to address the unequal representation in cycling advocacy. The Council is charged with overseeing the League’s Equity efforts and ensuring that they fit within the scope of the organization’s mission and are truly beneficial and relevant to the communities not normally seen as part of cycling advocacy. The Council will see the League through an internal assessment of how it can perform better on the issue of equitable representation and also develop tools for other organizations seeking to engage communities in equitable programming as well. Explorations into an organization's participation in exclusionary tactics in its past can often be painful or unpleasant however those that have the courage to seek out their faults, identify them and act upon them to their fullest capability are the organizations that thrive with the respect of their membership. 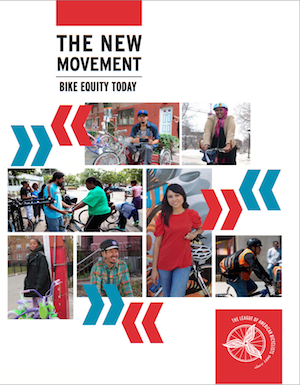 The League produces reports on bike equity and compiles resources related to equity in the bike movement.